Happy Groundhogs Day! So, there's been conflicting reports of whether or not spring is on its way or if we have another few weeks of winter. One of New Jerseys groundhogs predicted an early spring, but notable groundhog Punxsutawney Phil predicted 6 more weeks of winter. Either way, it's cold out today and it's going to get even colder the next few days in the northeast. 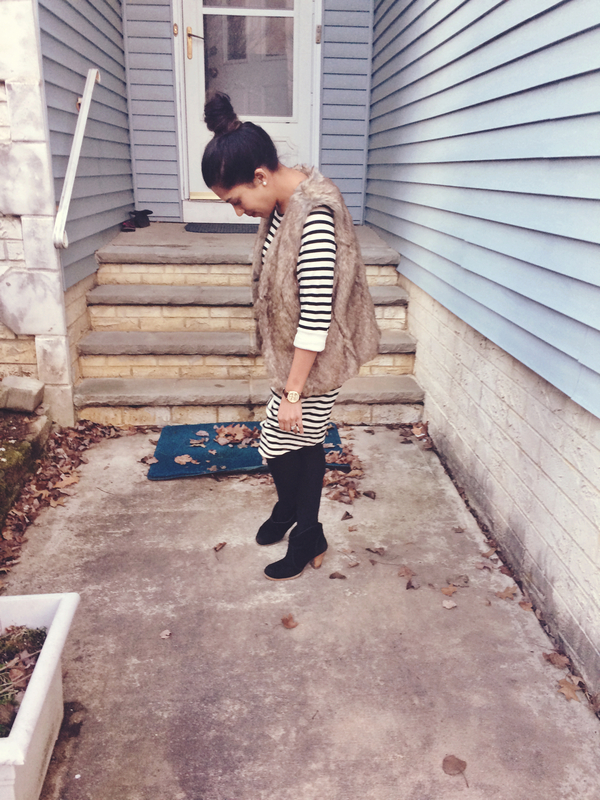 What better way to keep warm than to wear a faux fur vest? I've had this vest in my closet for years now. The great thing about this vest is that it can pretty much be worn with anything. I've worn it with jeans, with dresses and skirts, and with leggings. Today I'm showing you how I styled it for the office. 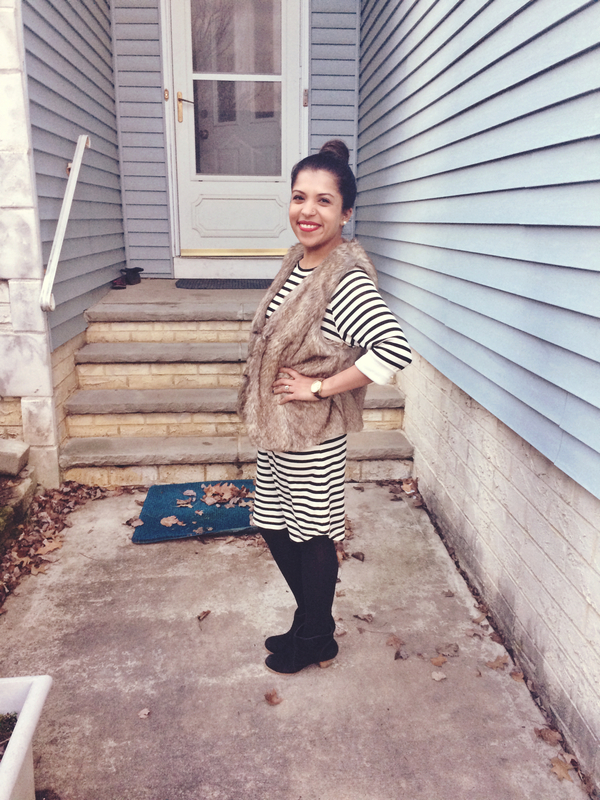 I paired the vest with a black and white striped dress (my favorite pattern! 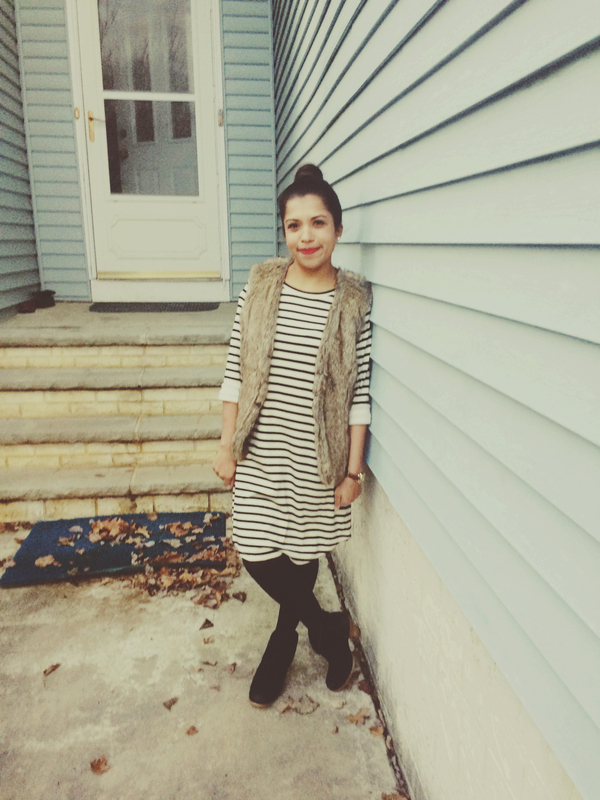 ), black tights, and booties. I'm lucky to be escaping the cold this week just for a few days. I'm heading to California for work and Seattle right after. I'm so excited to be catching up with my dear friend Beth in California and my childhood friend Lauren in Seattle. The biggest perk about traveling for work is that I get to see my friends that are all around the world! I have some exciting posts coming up on the blog in the next few weeks - a weekday makeup tutorial for a quick and pretty office look, and some tips on exercising for when you don't have time to exercise. Coming soon!